Editor’s note: This picture is not the Bear Hills Trading Post but merely a representation of an early trading post of the era. From the 1600s to the 1800s trading posts were built and spread west searching for beaver pelts. In Europe beaver top hats were made from the shiny undercoat of the beaver, because of “its waterproof qualities and ability to be shaped into many styles”. Items in trading posts were traded according to the value of a beaver pelt. “Therefore a beaver pelt was the standard currency and all goods for sale or trade were given their value in MBs or made beavers”. A made beaver was simply a prime beaver skin in good condition. First Nations trade centered on made beavers. “A pound of English rolling tobacco would cost one MB, and a 4’ gun would cost 14 MBs”. Trading Posts were some of the earliest land marks we have in Canadian history. Kind of like the water towers and train stations of later on. The Bear Hills Trading Post established in 1888 was one such marker. It was located on the old Edmonton to Calgary Trail on the outskirts of present day south side Wetaskiwin. The post was operated by Mr. Ramsey and later joined by Mr. MacDonald. The building itself was made of rough cut logs. After a few years a barn, hen house, buggy shed, and living quarters were added on. 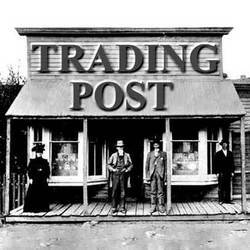 In the early days the trading post “was a dark and dingy place, and was a habitual hangout for half breeds and Indians. During the winter months, halfbreeds from long distances would come on snowshoes for supplies and mail”. The owners married Indian woman. The most popular day would be when mail carriers arrived. Settlers from far and near would arrive at the post to trade furs and produce for groceries and supplies. “The post smelled of hides and skins of animals that were piled high in the corner. The owners did a wholesale business in bartering for furs. A large wooden open barrel of crackers and ginger snaps, open jars of dill pickles, cheese, tinned goods, salt pork, boxes of dried fruit, gaudy bolts of calico a colored cloth that usually has patterns on one side, trays of beads, and cans of coal oil made up the stores supplies”. In the center of the main room was a large pot bellied stove used for heat in the winter months. Coal oil lamps with reflectors were attached to the walls “to give light, and a dim eerie light it was”. Bear Hills Trading Post included a post office and was the only one between Edmonton and Red Deer for quite some time. The Hudsons Bay Company operated an outpost at Pigeon Lake for a few years in the early 1800s. However many of the Cree traders travelled to the larger HBC post in Fort Edmonton to trade their valuable furs. “Famous Hudson Bay blankets were graded according to quality and featured black stripes on the side which designated how many MBs they were worth. First Nations people favored the blanket “because of their warmth and ease to carry, and the status that came along with owning them”. At the height of the fur trade 184,000 animal pelts a year were shipped to Europe to satisfy the insatiable need for fur. Obviously this demand dangerously taxed the beaver population of Canada. The beaver became the national animal of Canada and is obvious why. The old trading posts are long gone and are preserved only in history and the opening up of the west.